Malachite is green stone with irregular bands of lighter and darker green. The name malachite comes from the Greek word malache which means mallow, for the mallow leaf of the same hue. 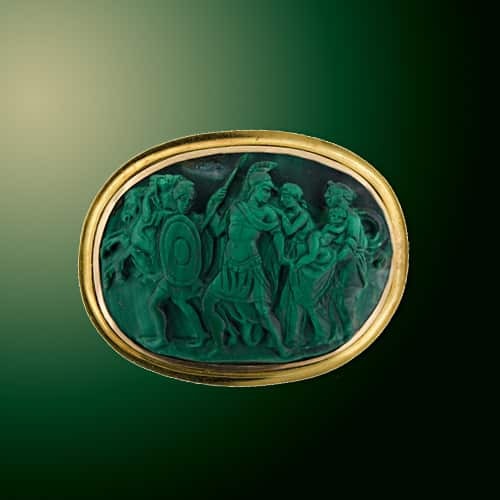 Malachite was popular with ancient civilizations in Egypt, Rome, and Greece where it was used in jewelry as well as cosmetics. During the Middle Ages, people believed it protected against childhood dangers as well as being a cure for vomiting. Gem cutters pay special attention to orienting malachite in order to showcase the interesting layers and markings. This makes the stone popular for objets d’art, jewelry, inlay and other ornaments. Gem Reference Guide, Los Angeles: Gemological Institute of America, 1988. Pp. 161-162. Newman, Harold. An Illustrated Dictionary of Jewelry, New York: Thames and Hudson, 1981. Pp. 192. Schumann, Walter. Gemstones of the World, New York: Sterling Publishing, Co., 1977. Pp. 176.